I can’t tell you how much fun I had creating these new rose paintings in watercolor. It seems I can’t get enough from doing roses again and again. 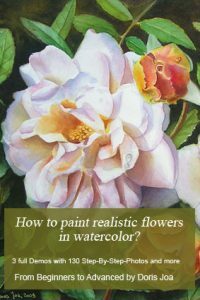 These new rose paintings in watercolor are all created in a new very attractive size. 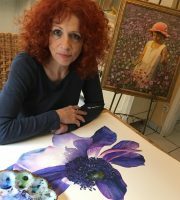 Each measures 12″x24″ (30×60 cm) and each rose is painted on stretched canvas. This means the paintings don’t need to be framed behind glass. Each painting will be varnished to protect it. Note: Each of this rose paintings costs $450 plus $58 international shipping (airmail and insurance). Shipping costs are already added to the price, so the price here is $500 and in your card $8 standard shipping costs will be added. If you are ordering from germany etc. please contact me at first about shipping costs. 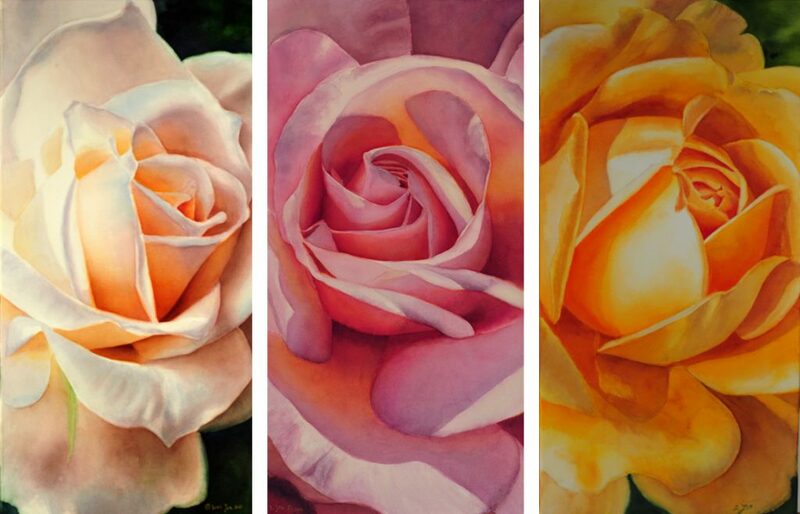 These three rose paintings in watercolor look great on their own or even in a set of two or all three together. They make a dramatic large painting in a group – or a lovely elegant painting as a single piece. I started at first with the white rose painting. It is always fun to paint the colour white – as it isn’t really white. But I love to create the soft shadow colours so that we read the colour white. 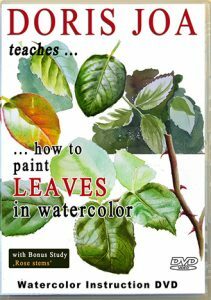 To create the shadows I used reds and blues and greens and yellows. 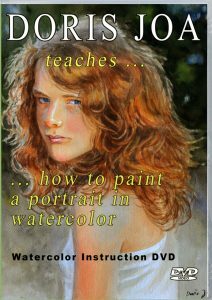 Learn to paint the colour white. The yellow rose painting really glows with its bright colours. I used a lot of New Gamboge (a warm yellow from Winsor and Newton)), Aureolin (cool yellow) and I also added some Translucent Orange to make the warm areas really glowing and hot. Aureolin and Translucent Orange are Schmincke watercolor paints. For the shadows I added some blue, some red and also some green. Learn to paint the colour pink. 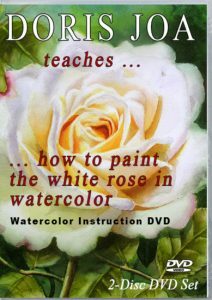 I love to paint pink rose paintings. And then I use my favorite colour Permanent Rose from Winsor and Newton. I am using this colour for a very long time now and I still love it. For cooler areas I added some Purple Magenta. I also used again blues and greens and also yellow and orange. 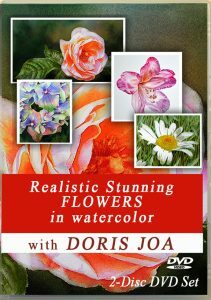 For all three rose watercolor paintings I used a lot of layers to get the richness and depth which I wanted to create.